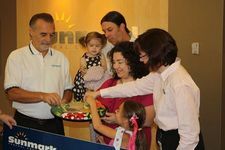 Everybody say hummus: Sunmark president/CEO Bruce Beaudette; Matthew Paniccia and daughter Sophia; Jennifer Rittner-Paniccia and daughter Olivia; and Susan Siegel, a Sunmark senior vice president. Let's hear it for giant checks and hummus! 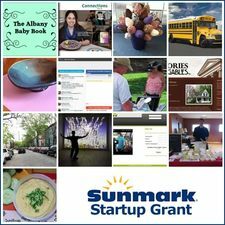 Yesterday the winner of this year's AOA/Sunmark Startup Grant -- 3 Chicks and a P, a small business in Rotterdam that makes hummus, bean dips, and tapenades -- got its prize money from the people at Sunmark. The giant check came with $1,500 actual dollars (in a smaller check via direct deposit) that 3 Chicks owner Jennifer Ritner-Paniccia and her husband Matthew say they'll use for nutritional labeling for some of their newer flavors. They're hoping the labeling will help get their products onto supermarket shelves. 3 Chicks currently sells at local farmers' markets and co-ops. Everyone celebrated the giant check with broccoli and hummus. We'll be checking back with 3 Chicks and a P in a few months to see how they're doing. The three finalists in this year's AOA/Sunmark Startup Grant competition made their presentations to our panel of judges this week at the Albany Colonie Chamber of Commerce. There were a lot of good submissions for this year's AOA Sunmark Startup Grant. 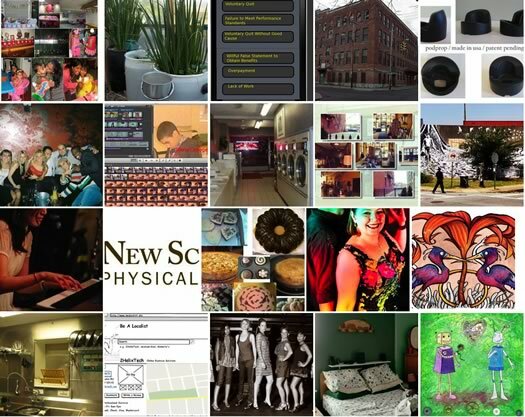 Projects ranged from a resource for new parents, to car sharing, to art, to web apps, to food. If you haven't read through the applications, you should -- you might find a project with which you'd like to get involved. But there can only be three finalists -- two selected through crowd voting, the other by the Editors. We're about halfway through the voting for this year's AOA Sunmark Startup Grant. The leaderboard, as of Wednesday (May 9) afternoon, is posted in large-format after the jump. 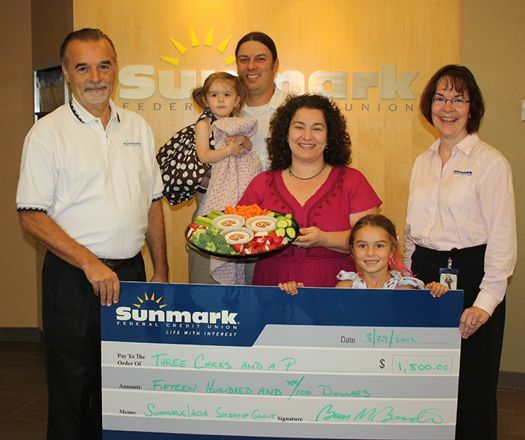 Big thanks to Sunmark Federal Credit Union for its continued support of the startup grant. All the entries for this year's AOA Sunmark Startup Grant have been posted, and voting is now open. Two of the three finalists for the $1500 startup grant will be chosen by crowd voting. (The Editors pick the third finalist.) Voting ends this Friday, May 11, at noon. The final three will get an entrepreneurial crash course with business coach Janet Tanguay next week at the Albany-Colonie Regional Chamber of Commerce. They'll then make short presentations to a panel of judges, who will pick the winner. This year's group of applicants includes some interesting and potentially community-changing ideas -- ranging from food to art to transportation. Have a look and then go vote. Update: The applications are now closed. Voting starts May 7. Just a friendly reminder that the application deadline for this year's AOA/Sunmark Startup Grant is the end of the day Friday (May 4). Here are all the details you'll need to apply (please read them all before applying). We already have a handful of applications in, and we're getting them posted online. The sooner you apply, the sooner your application will get posted. Voting for two of the spots in the final round will begin the morning of May 7 (next Monday). The Editors will pick the third finalist. Last year's winners -- Scott Kellogg and Stacey Pettigrew from the Radix Center -- in their greenhouse in Albany's Grand Street neighborhood. They used the grant money to help start an indoor aquaculture system. Sometimes all a good idea needs to get off the ground is a little push. And we know there are a lot of great ideas floating around the Capital Region. So we've brought back the AOA Sunmark Startup Grant. Sunmark Federal Credit Union is offering a $1,500 startup grant to help get one local micro-enterprise off the ground. And once again, you get to help decide who gets that funding. Or -- you know -- maybe even enter your own idea. Last year more than 30 people or groups submitted entries to compete for the grant. It was inspiring to see the variety and creativity among the entries -- from cheesecakes and cell phone pods to public art and aquaculture. We're really looking forward to seeing what people come up with this year. Everyone loves the giant check. When the people at Sunmark asked us if they could give one of those giant cardboard checks to the Radix Center for winning the AOA/Sunmark Startup Grant, our response was something along the lines of: "What other sort of check would you give them?!?" It's true: everyone loves the giant check. 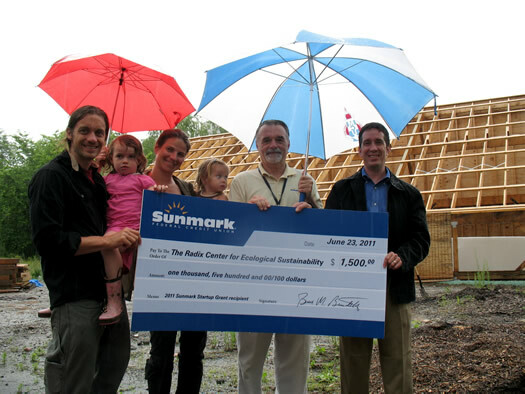 And this afternoon, Sunmark CEO Bruce Beaudette and director of marketing David Weinstein stopped by the Radix Center's site in Albany's Grand Street neighborhood to present the money to Scott Kellogg and Stacy Pettigrew. Thanks again to Sunmark for funding the startup grant. And congratulations to the Scott and Stacy -- we're excited to see their greenhouse and aquaculture system develop. A few more pics -- of the giant check and the under-construction greenhouse -- after the jump. 36 entries, 3 finalists, 1 winner. After hearing the presentations, the judges have made their decision in the Sunmark Startup Grant contest. Last night was the final leg of the AOA/Sunmark Start-up Grant competition: the final presentations. 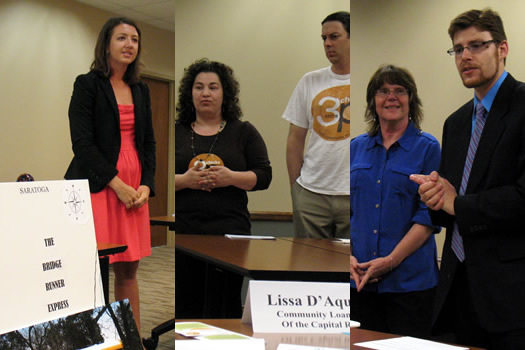 Judges Blake Hanan (Mealeo.com), Lorraine Murphy (Bettie's Cakes) and Lissa D'Aquanni (Community Loan Fund of the Capital Region) heard 20 minute presentations from the three finalists. We had 36 projects apply for the AOA/Sunmark Startup Grant. And if we had the money, we'd give a $1500 push to a bunch of them. Really -- there were a lot of worthy projects. Thank you to everyone who applied. But we can choose only one. And to reach that decision, we needed to narrow the field down to three finalists. Two of the spots have been picked via crowd voting. The third spot is a pick by the Editors. The top 10, as of Thursday night. 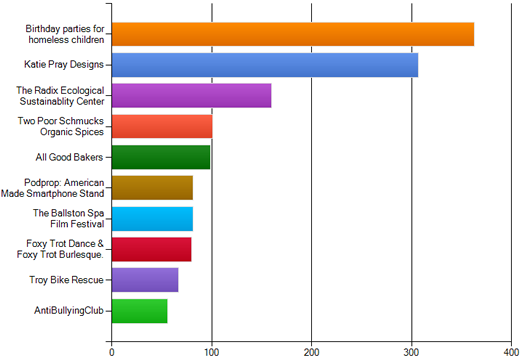 We're just about at the halfway point in the voting to select the finalists for the AOA/Sunmark Startup Grant. The chart above has the top 10 vote getters, as of Thursday night (and 1,400 votes). Two projects -- Fazana Saleem-Ismail's birthday parties for homeless children, and Katie Pray Designs -- have separated themselves as front runners. But we still have almost three days of voting to go. That's plenty of time for other projects, even those outside the top 10, to move into the top two. The top two get a place in the finals. The Editors will choose the third finalist -- and it's going to be tough. There are a bunch of interesting ideas! Voting ends at 6 pm on Sunday. A handful of the entries. We're very happy to introduce the slate of entries for the Sunmark Startup Grant. Thirty-five projects have submitted an application for the $1,500 grant. The projects range from bakeries to mobile apps to fashion design to jazz to birthday parties for homeless kids. We wish we could give a push to a bunch of them! But there can be only one winner. To get there, we need three finalists -- and that's where you come in. Two of the finalists will be picked via crowd voting. And it's now open! (You should probably browse the projects first.) The last spot in the finals will be chosen by the Editors. Voting ends this Sunday at 6 pm! The Sunmark Startup Grant is funded by Sunmark Federal Credit Union. Update! The deadline has been extended. In the 3+ years since AOA began, we've met a lot of creative people with interesting business, art and community ideas -- everything from music festivals to bakeries to urban sustainability projects. Starting something new is hard. (We know.) And one of the biggest problems in getting a new project off the ground is that first bit of funding. So AOA is partnering with Sunmark Federal Credit Union to give a good idea a little push. Sunmark is offering a $1,500 startup grant to help one micro-enterprise move forward. And you get to help decide which idea gets the funding. Maybe that idea is yours.